Hometown Museum booth at the D23 Expo. 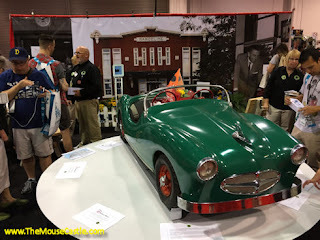 Another D23 Expo has come and gone. Hopefully you caught our slightly inebriated recap of the festivities on Inside The Mouse Castle. Today, we’re going to sit down in the Lounge with some of the people who were part of the Expo. We’ve got Kaye Malins and Peter Whitehead with the Walt Disney Hometown Museum in Walt’s boyhood home of Marceline, MO. They’re going to talk about their ambitious fundraising efforts to restore the Midget Autopia, which was relocated from Disneyland to the city of Marceline in 1966. It operated in Marceline for a number of years before falling into disrepair and now the Museum wants to bring it back…and you can help. Before we get to that, though, we’ll be joined by the former director of corporate synergy with Disney, Lorraine Santoli. 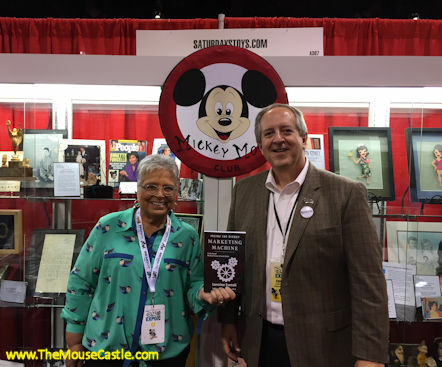 She’s also an author who’s had a longtime association with the original Mouseketeers. In fact, Lorraine hosted a celebration of 60 magical years of the Mickey Mouse Club at the D23 Expo. She was joined on stage by Sherry Alberoni, Sharon Baird, Bobby Burgess, Tommy Cole, Darlene Gillespie, Cubby O’Brien and Doreen Tracey. It was a delightful presentation. 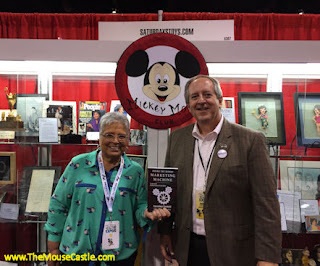 Before the Expo, Lorraine and I chatted about her latest book, a memoir of her 22 years at the Walt Disney Company, Inside The Disney Marketing Machine. In it, Lorraine recalls the many memorable events she was part of in the 1970s, '80s and '90s, including Mickey Mouse’s 50th birthday, Donald Duck’s 50th birthday and Disneyland’s 30th anniversary. She also talks at length about the leadership styles of Disney’s top executives during that time, Michael Eisner and Frank Wells. It’s an insightful look behind the scenes of an entertainment company on the verge of becoming the media giant it is today. For more fascinating books about Disney history, visit www.ThemeParkPress.com.